The songs of Madness – Our House, Baggy Trousers, My Girl, Embarrassment, Driving in My Car, The Wings of a Dove, Night Boat to Cairo and the all-time classic It Must Be Love – are some of the best-loved pop songs of all time. 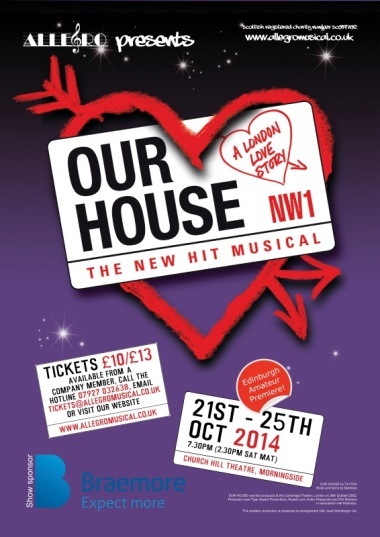 Winner of the 2003 Olivier Award for Best New Musical, Our House is a touching tale of life and love, heartbreak and comedy, right and wrong, set in London’s Camden Town in the mid nineteen eighties. it’s Joe Casey’s sixteenth birthday and he’s treating his girlfriend Sarah to an evening in a brand new luxury apartment – the only problem is they have to break in. When the police turn up, Joe has to decide – run away, or face the music – a choice that will set the course of his life, and his love, forever. A bouncy, big-hearted party production of Our House, the Madness jukebox musical, is desperate to burst on to the stage of the Church Hill Theatre. The Allegro Musical Company, under the guidance of new (to them) director Andy Johnston, have an undoubtedly enthusiastic presence on stage. Musical director Finlay Turnbull has got the company right into Madness’ fine tunes – much more tricky and subtle than you might think. And choreographer Caroline Howie Inglis gives them some very creditable moves to get together on the all-too small stage. If the hits of Madness are mostly remembered as baggy-trousered, bouncy, party numbers, there is nothing simple about the storyline of Our House. It is to Johnston’s great credit that he makes its two concurrent but contrasting narratives twist in and out of each other with great clarity. The show starts with young Joe Casey breaking into a swanky show-flat to impress his girlfriend Sarah on his 16th birthday – armed only with a novelty condom and a story about how the estate on which he lives was built by his grandfather, who was gifted the house in the middle of the street named after him. So much so simple. As is the way with musicals, the ghost of Joe’s wayward dad is watching over the pair. And when the police turn up to investigate the break-in, Dad observes the two alternative lives which could subsequently follow for young Joe and his friends. It is these two alternative lives which create the Sliding Doors plot of the ensuing musical. Thomas McFarlane does a fantastic job as Joe, working both roles with ease. He succeeds in giving the darkly clad Bad Joe a swagger of cruelty. While his Good Joe might be ned-like to look at, with his baseball cap and white shell suit, McFarlane brings a naturally hopeful naivety to him. Emma Collins is equally strong in her role as Sarah. She has the stand-by-your man sense of internal strength – and is clearly a better judge of character than her starry-eyed friends. And she, too, helps ensure that the two strands are clear, by giving different reading to her character in either one. Towards the end of the show, when Collins gets her pipes around a deliciously plaintive NW5 with Richard Tebbutt as Joe’s Dad – which moves off into a softly focussed duet version of It Must Be Love with McFarlane, you get a glimpse of how strong the music on stage could be. A glimpse, only, because for the most part the opening night of the production was a technical rehearsal – or two – away from being ready. The singing on stage looked as if it was good enough but you often could not hear it to tell if it was or not. Whole sections of dialogue were lost behind the orchestration with the sound balance being completely out of kilter. The main losers in this regard – apart from the audience – were the central duo’s pals. Andrew Knox as the simple Emmo and Ronnan Radin as lunkhead Lewis on Joe’s side with Emma Dawson and Lori Flannigan as Billie and Angie on Sarah’s. With much of the comedy and not a little plot development in their mouths, not being able to hear them was a decided disadvantage. Particularly as they have so obviously built a great on-stage raport. Not that all the difficulties are technical. Choreographer Caroline Howie Inglis has created some big strong numbers which still allow all 35 of the on-stage company to operate. On the whole these are great fun. Yet there is none of the crispness or unflinching commitment you expect from this company. That said, what is there is miles ahead of the substandard professional production which toured to the Festival Theatre a year ago – although it suffered from similar technical difficulties. Wardrobe, too, deserve a special mention with the likes of school-kid outfits for Baggy Trousers and plenty of naff eighties clobber on show. Our House might have first been performed in 2002, but Madness provided a soundtrack to the early eighties and Kate Dixon’s Wardrobe department nail that period, spot on. Anyone seeing the show is going to come away humming the tunes. And there is still a great show waiting to get out, onto the stage. It will undoubtedly be released by the end of the run – the big question is how soon. 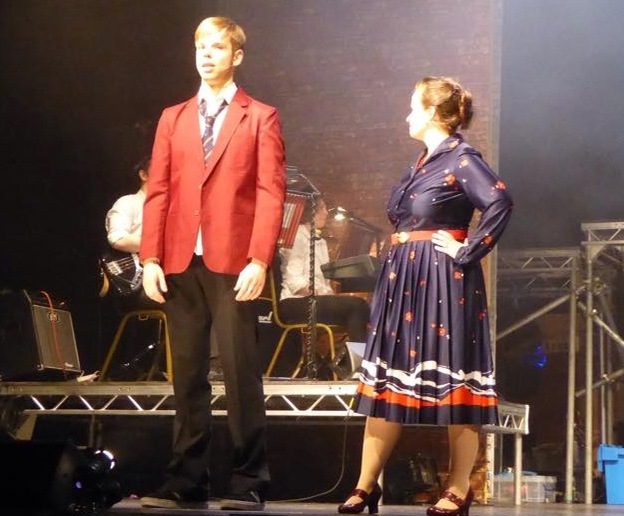 For some local am-dram groups, it makes sense to showcase musicals that are well-known, cheap to produce and small in cast size.Allegro, however, are a little bit different. Not only have they devoted themselves to an epic showpiece involving 42 cast members, a full band and an onstage car, they’re tackling a musical that was never that successful in the first place. Madness?Churchill Theatre is Our House this week, folks, and for one resident – 16-year-old London geezer Joe Casey – his life is literally about to go down two different garden paths.Keen to impress his girlfriend, he breaks into a building site and it’s not long before the police are hot on his trail, forcing Joe into making a life-changing decision: stay and take the rap for the sake of his girlfriend? Or flee the scene and continue his crime-laden existence? Unable to decide, we witness both Joe’s good and bad futures, backed, of course, by a soundtrack of hit songs from 80s ska-pop legends Madness. OK, so there were a couple of technical issues, but it’s to be expected on opening night (a wee bit of ironing will quickly sort the creases out) and in no way did it reflect the abilities of the performers. The real fun concerns the “madness” of the chorus’s nutty, colourfully chaotic, song ‘n’ dance routines. For if you aren’t in the mood to “skank” along by the end, well, you probably need your knees seen to by a doctor. The chemistry and wit between sassy slappers Billie (Emma Dawson) and Angie (Lori Flannigan), meanwhile, was audibly appreciated every time they appeared. And while lead actor Thomas McFarlane is to be commended for his performance, too, there’s no getting away from the fact that he comes across as too camp and clean-cut to be wholly believable as street-wise tough-nut Joe. Nevertheless, Our House remains a House Of Fun. It might need to go One Step Beyond to rack up another review star, but it’s by no means an Embarrassment. Take the Night Boat To Morningside and see for yourself. Allegro have always been a company willing to tackle some of the lesser known or performed shows and this year was no exception. 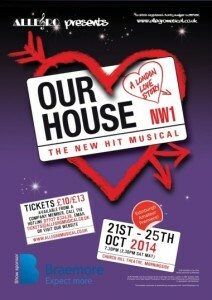 ‘Our House’ is rarely performed perhaps because, despite the music being lively and well known, it is technically a very difficult show. With 39 scene changes it faces the possibility of being rather slow moving. This was certainly not the case in this production. Although the story is quite disjointed, the production moved along at a good pace. The dynamic, energetic chorus gave it their all in the big production numbers where the choreography was lively and slick. ‘Baggy Trousers’ with it’s cheeky schoolkids was excellent as was ‘Wings of a Dove’ which exuded enthusiasm and fun. One of my other favourite scenes was ‘The Sun and the Rain’ with it’s colourful stallholders and quirky use of umbrellas. The principal characters were all well cast. Thomas McFarlane gave a strong performance as Joe Casey successfully demonstrating the contrasting characteristics and attitudes of Good Joe and Bad Joe as he follows the two different paths of life he can choose. This is a marathon role with Joe rarely off the stage and constantly having to quickly change costume to suit the character and Thomas did this admirably. He must have been exhausted! Emma Collins is a good all round performer and was a charming girlfriend Sarah developing her character to compliment the good or bad Joe. The duet ‘It Must Be Love’ was well sung by Sarah and Joe. Lori Flannigan (Angie) and Emma Dawson(Billie) were a great double act with a natural rapport while Andrew Knox (Emmo) and Ronan Radin (Lewis) were also a strong pairing providing humour and support for Joe. Richard Tebbutt (Joe’s Dad) gave a grand performance with his powerful voice and good stage presence. Much of the music of Madness is well known and the company were vocally strong and enthusiastic. The storyline of ‘Our House’ is quite complicated to follow and unfortunately it was at times difficult to hear the dialogue and song lyrics due to the inconsistency in the balance of sound between the band (a very good band) and the vocalists and over amplification causing distortion. This was a great pity as much of the humour and story was lost and did distract from an excellent production. The show was very well costumed throughout with it’s colourful 80’s style costumes lighting up the stage. All in all this was a good and enjoyable production of a difficult show which had the audience singing along in a well directed finale.